There is no better month in the calendar than May. In my garden the lilacs, dusky parrot tulips, early alliums and herbaceous peonies all cavort with the aquilegias I never got around to weeding out (and I’m glad I didn’t). In this episode of the podcast I’m sitting back and marveling at what this month does in the garden. All of the things I love best, including lilacs, rhododendrons and wonderful wisteria are at their fragrant, flowering peak. Most of the tones in the garden are purples, with the occasional shot of Barbie pink from a herbaceous peony I’ve never managed to identify. If you’d like to come see for yourself, my garden here in East Lothian is open this Saturday 24 May from 10am-1pm, raising funds for research into an ultra-rare disease that affects a close family friend. So in this podcast I’m also looking at some of the stunning plants donated for the “Rare Plants for Rare Disease Research” fundraiser. If you are within driving distance at all of Edinburgh, please visit us (postcode EH34 5DA if you’re traveling by GPS), and enjoy wonderful homemade cakes and teas, as well as a selection of plants from some of Britain’s best-known nurseries, many of whom just picked up medals at RHS Chelsea Flower Show 2014. All proceeds go to researching the causes and potential cure for neuracanthocytosis (NA), a neurodegenerative disease which affects just one in 7 million people: sadly one of those people is Alex, daughter of my very good friends in London. Please come on Saturday with a fat wallet and a full heart, and help us fund the research that can make such a difference to Alex. Tis the season to be anxious about weeds, garden pests, drought, flood — you name it. In my part of the world, the growth spurt in July is almost indecent, and unless the weather is just right, overgrown plants are suffering from too much or too little water, or from a host of beasties preying upon so much succulent growth. But I’m not going to talk about any of that. In my garden, two frightening garden pests appeared within weeks of each other: a New Zealand flatworm, a pest which eats earthworms and may presage soil death, and my first garden gnome, a pest which offends good taste and many presage meerkats dressed like Chelsea pensioners. Is that a flatworm or a potato peel? A few weeks ago, I moved a trug near the place where I was digging out an apple tree. Curled up where the trug had been was a snotty little circle of flat slime, like a pressed slug. I washed and poked it under the tap — it looked almost exactly like an old peel from a potato or sweet potato, but I suspected from the texture of it that it was something alive. I left it on a plastic lid near the tap, and a few moments later, it was squirming about with its pointy little nose, horrifying me. Yes, it was a New Zealand flatworm. The best resource I found was this flatworm info website from Northern Ireland, and if you find one in your garden in Scotland, do report it to flatworm expert Dr. Brian Boag, who isn’t currently collecting samples but is mapping its spread. You can also contact his colleagues for England and Wales flatworm sightings. I put out some black sheeting to try to catch any others, but I have only found the one. When I was digging out the apple tree, I had remarked on the relative lack of earthworms there; there are some observations that earthworms in parts of Scotland have reached an equilibrium with the flatworms, and are not wiped out; we shall see. Ground beetles are thought to predate flatworms, fortunately. Why is there a gnome in my garden? My sister-in-law gave each child a garden gnome in their party bag for her girl’s fifth birthday, and my daughter brought hers home and jubilantly placed it in the garden, someplace “he wouldn’t get wet”. He’s what you might expect: round, hatted, smiling. Now here’s the mystery: why doesn’t he bother me? 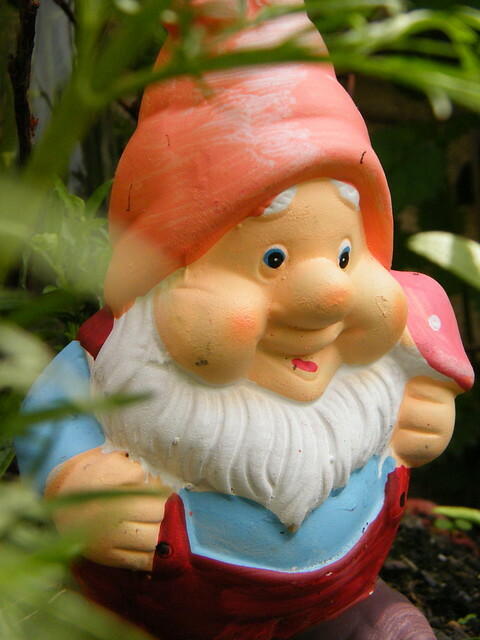 I’ve been working on making sure the garden isn’t only my place — with the aid of some very wise readers like Carolyn, I let my kids plant literally anything they wanted into their barrel gardens this year, quashing my micromanagement instinct — but still, I would have thought I’d be horrified at gnome creep in my garden. I’m not. He’s lovely. And after our little dog died earlier this month, my daughter put the gnome on top of Lizzy’s grave. We’re all pretty devastated by losing Lizzy, and I’m glad she has a bit of company. And maybe it will scare off the flatworms. I’ve spent the last few days experimenting with the right place for these forced hyacinths, which went into pots last autumn. On the desk was too much. In the windowsill was too much. At the opposite end of the house near the back door is just about right. It’s not just that the scent is inescapable — it’s the fierce sweetness of it, like being force-fed a pint of syrup. Topping my list for what I want from the garden is fragrance, so it’s odd that some of the most common flower scents repulse me. This summer I’ll be cutting every sweet pea in the garden again and handing them over the wall to my neighbour Hilary, for much the same reason — a choking sweetness that I cannot love. I don’t know many other people with a cottagey garden who will admit to hating the scent of sweet peas: if you’re one of them, do me a favour and speak up. My top ten thrilling flower scents — and I don’t grow all of these — have to be daphne, rhododendron luteum, phlox, nicotiana, zalutiniskaya, lilies, pinks, monarda, lavender (English, not the resinous French), and above all, roses. I shouldn’t throw roses into that mix because their scent, for me, is less a preference and more a requirement for healthy mental functioning. The roseless months of the year are dark ones, and I remember standing at the rose border by the top of the lovely Inveresk Lodge Garden last June, looking at a rugosa rose, the first on the bush, just opening. Do you ever have moments that become a lasting, living image? Before leaning into it I stopped and thought, right, here’s what I’ve been waiting these months for. The scent was — well, you know what it was. Perfection. These hyacinths are becoming more tolerable now — my brain is beginning to ignore the shouting scent picked up by my nose — and they do point the way out of this Scottish winter towards spring, so they can stay. At a distance. What are your thrilling garden scents? Are there flowers you can’t take, or feel you “should” like, but don’t? That was the year I resolved to stop growing flowers and start growing roots. I would prioritise the underground happiness of the plants, but I’d also start planning the garden around who I am, ie a neglector of containers. Except in winter, when a small pot of snowdrops sits by the back door to cheer us up, my only containers are huge ones which need just a little from me, and not very often. Control the use of colour: flowers of similar colour tones planted together are restful and harmonious to the eye — like the restrained palatte in the picture above, showing our small main border. I no longer buy “mixed” colour tulips, pansies, seeds or anything else. A single contrasting pair of colours, like blue and orange, is also pleasing and looks lively to the eye as opposed to restful. Foreshortened views suggest abundance: you don’t have to wait until your borders are overflowing like a botanic garden to get a feeling of abundance. Position garden seats (or your plants, if you’re starting from scratch) so that you have a foreshortened view down along the border, instead of across it. That way, to your eye, plants not located near each other will seem to come together, giving the impression of an overflowing garden, and bringing colours right up next to each other. Hide parts of the garden from view: paradoxically, even a tiny garden feels bigger if you find ways to hide part of it from immediate view. The hedge or fence with a gap in it, a plant placed to partially obscure a view, a path that winds away from the eye so you can’t see its full length, or even a false door in a boundary wall that leads nowhere — all these suggest an undefined “something more”. Subconsciously your brain speculates and projects about what it could be, and the garden ends up feeling bigger. Too many design books offer blueprints and drawings instead of what I really want: inspiring garden photography where the plants are all identified, and clear, contextual explanations of design principles. At the moment I’m in love with the practical and beautiful Fabulous Flowerbeds by Gisela Keil and Jurgen Becker. If you have a design must-read book, or a design golden rule you’d recommend to me, I’d love to hear them. It’s incredibly satisfying to see autumn sown sweet peas soar into the sky as soon as early June, and I’ve tried to get organised every October for the last few years to start my seeds off in good time. During some of the televised coverage of Chelsea 2008, Derek Heathcote of Eagle Sweet Peas explained the best way to do autumn sowings. I was recording all the coverage at the time and am so glad I kept it for reference, because Derek’s method is fast and it works — no fiddly soaking or chitting of seeds, great germination rates, and very healthy specimens for planting out in spring. I’ve just discovered that his instructions are also on his website. They differ only slightly from what he said on TV, where he used cheap plastic drinking cups (with a drainage hole cut into the bottom) instead of grow tubes. Derek emphasises how important it is to get the new plants out into a cold greenhouse once they’ve germinated. They don’t need mollycoddling! I’ll be back to Derek’s website later — for cut sweet peas, he offers tips on how to get rid of the black pollen beetles that always hitch a ride onto the flowers and end up crawling about your kitchen table.